What’s your favourite children’s book app of 2014? Bloggers are looking for your nominations for a prestigious award. The deadline is 15 October 2014 via the Cybils Nominations Page. Authors/illustrators and publishers will also be able to nominate books for a short period after public nominations have closed. 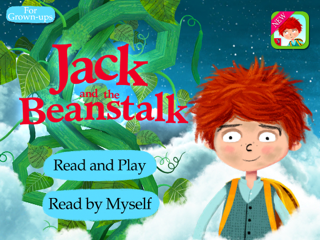 I’ve nominated Jack and the Beanstalk by Nosy Crow. It’s a fantastic example of how reading and gaming can be brought together in one place, and successfully extends Nosy Crow’s range of apps towards readers aged 6 to 8. I haven’t downloaded many book apps this year, but we particularly enjoyed PJs PJs – Giraffes by Ink Robin, Hat Monkey by Fox & Sheep/Chris Haughton, and for older readers Love, the App by Pablo Curti which won a prize at the 2014 Bologna Book Fair. If you also enjoyed these, perhaps you could nominate one of them. Or let me know what you’ll be nominating in a comment below. Great! I nominate “Hat Monkey” of Fox & Sheep/Chris Haughton!